It’s Friday! It’s been a big week for us and we’ve been celebrating since Monday with this amazing Facebook contest! In case you hadn’t heard, we’ve just released our brand-new Peptide Renewal Serum and Peptide Renewal Cream! TEN lucky winners will get both of these new products. If you’d like to enter to win, simply CLICK HERE. This contest is open to residents of the US and Canada. It runs from July 1-7, 2013; winners will be announced and contacted on Monday, July 8, 2013. WoW! 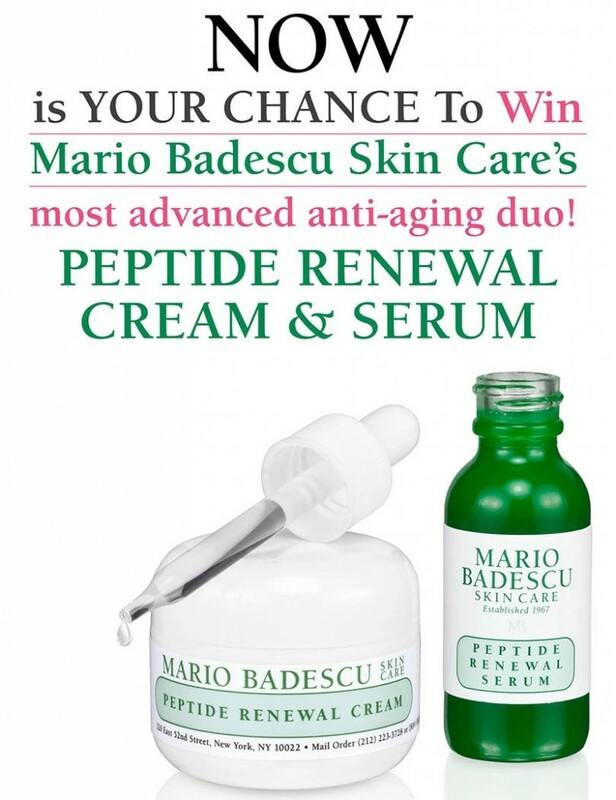 I would give anything to try this Duo, especially now that I am almost 30 and I really want to try Ant-Aging Products…..I LOVE MB Products! Count me in on this fabulous beauty giveaway! Always, I mean always concerned with my skin, and my daughters. Mine is aging hers is acne. Glad I discovered Mario Badescu! I Would Love to try this Awesome Skincare Duo, Your Products are just something I always look forward to using every day and night! The way I see it being a bsy stay at home mom doesn’t mean not taking care of my skin. It is the perfect time to go no makeup and take care of my skin. Mario Badescu makes this easier. I love the way my skin reacts to this line. I would really love to try this new product. Skincare is very important to me, as women always want their skin to look flawless. Need this serum and cream to renew my aging skin! i received my free samples and have been using it every day! my skin has looked amazing. love this product. LOVE MB products – they are the best! I have been trying different products recently and I am pleased with the way they feel on my skin and I think I have seen some improvement. I always love Mario Badescu because I feel like from the packaging to the products themselves, there is no hidden agenda! “This is what it is, this is what it does.” The best products sell themselves which is how I feel about Mario Badescu! Pick me please – never mind birthday years try dealing with a 21 year old stepson! Would love to try this product, sounds like it would be really good!